Saturday, November 18, 2016 , NYC 60 K a.k.a. Knicerbocker 60 for six straight year is in the book. It was a nice and perfect day for a long run and seeing some friends running, pacing and cheering. So proud for pacing a friend Ibar Dinampo on his first ultramarathon from the start line up to the finish line with a time of 6:54:31. It was an amazing weekend! Sunday, November 6, 2016, I completed my 12th New York City Marathon with a finishing time of 3:38:31. Boston bound! It’s official! This landed in my mailbox on Monday morning, September 19, 2016. My 2015 and 2016 Badwater 135 ultras were the original routes which starts at Badwater Basin, Death Valley, which is the lowest point in North America at 282 ft below sea level. The race covers 135 miles (217 km) over Death Valley National Park and Owens Valley and finishes at Whitney Portal at 8,300 ft (2530m). The Badwater 135 course covers three mountain ranges for a total of 14,600 ft (4,450 m) of cumulative vertical ascent and 6,100 ft (1,859 m) of cumulative descent. Whitney Portal is the trailhead to the Mt. Whitney summit at 14,508 ft which is the highest point in the contiguous United States. 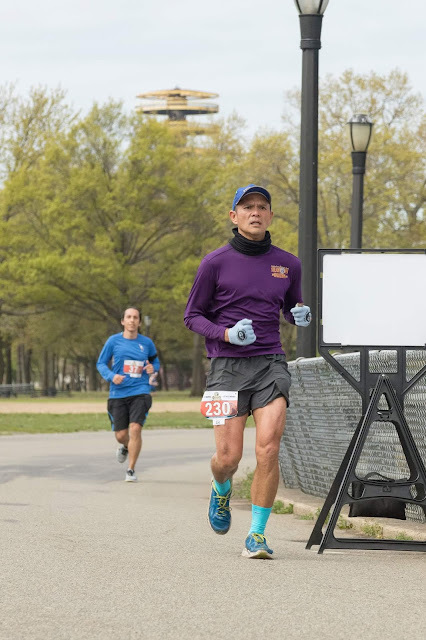 Along the race course, runners go through the landmarks such as Mushroom Rock, Furnace Creek (mile 17), Salt Creek, Devil’s Cornfield, Devil’s Golf Course, Stovepipe Wells (mile 42), Townes Pass, Panamint Springs ( mile 72), Darwin at Panamint Pass (mile 90), Alabama Hills, Lone Pine (mile 122) and the final ascent to Mt. Whitney Portal. In my first Badwater 135 in 2014, the race took a different route over Owens Valley but it was equally challenging with three mountain pass ascents for a total of over 17,000 ft (5,800 meters) of cumulative vertical ascent and 12,700 ft (4,450 meters) of cumulative descent. 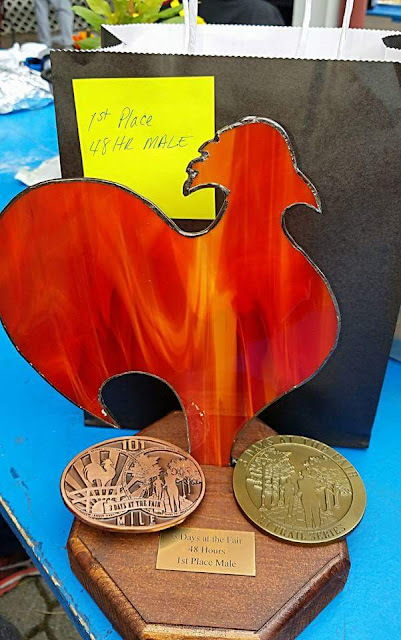 The difference with the original route is the first 90 miles of the race which started in Lone Pine at 3,700 ft (instead of Badwater Basin), then the 22 mile slow ascent to Horseshoe Meadows at 9,900 ft, back to Lone Pine and into Keeler at 3,600 ft, a steep ascent to Cerro Gordo at 8,150 ft then to mile 90 in Darwin of Panamint Pass. The remaining route switches back to the original route to finish at Mt. Whitney Portal. The change in route in 2014 was due to policy changes made by the newly designated Park Superintendent which required a review on the safety runners through the Death Valley National Park. However, this did not prevent the Badwater 135 AdventureCorps (the event organizers) to run the race that year thus the change in the race course. As far as the Filipino runners are concern, Ben Gaetos considered to be the first Filipino to finish Badwater 135 in 2013, me in 2015 and 2016, and Tess Leono in 2016, ran the original Badwater 135 race course. So far, only me and Tomas Zaide ran the 2014 alternative race course. The 2015 and 2016 races were night time starts, with three groups starting at 8 pm, 9:30 pm, and 11 pm, respectively. I am at the first wave start based on my career ultra running records and in view of my soft cut off times thus given an earlier head start. The evening is a cooler start but most runners are right away sleep-deprived for the next 2 days not only the runners but as well as the crew. My 2014 race started in the morning at 6:00 am so I became sleep-deprived the following day. So many ultra-running greats have ran Badwater 135 more than once and among the notable ones who finished and likewise who DNF (did not finish) in their other Badwater 135 runs include Dean Karnazes, Lisa Smith-Batchen, John Radich, Oswaldo Lopez, Marshall Ulrich and Scott Juric to name a few. For both rookie and veterans, it is always a challenge in the uncertainty along the way to finish or not to finish. Badwater is a crew dependent race, as race director (RD) Chris Kostman quoted, "we want the crew to suffer together with the racer”. 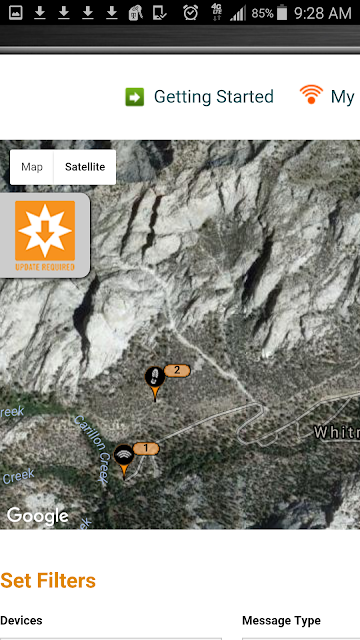 As a rule, you are not allowed to change crews or pacers until you get to Lone Pine at mile 122. 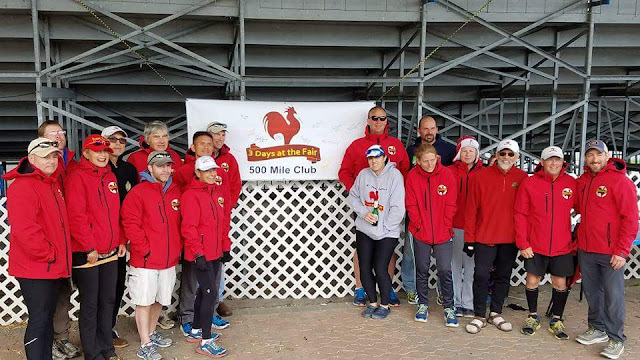 Amazingly, minor issues mixed with fatigue builds bond with your fellow crews and also runners on the course. No doubt that it is a team work and everybody has a responsibility to ensure that the runner finishes the race. I think by answering these questions, the organizers will have a good idea if what person you are. 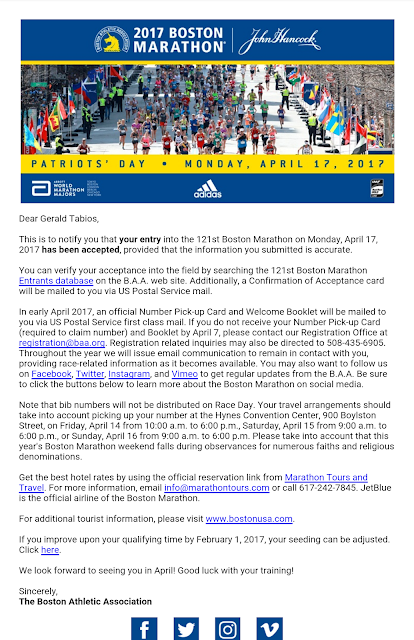 After getting accepted into the race, which took less than a month from the time of application, I immediately booked my hotels and flights and reserve my crew vehicle. During this period up to the race day, the event organizers specially the race director Chris Kostman are very keen on race details such as rules, updates and advisories through several email exchanges which one must read between the lines. For instance in 2014, for our team, we had our shirts with the word Badwater in it but then we realized that we are not allowed to print the word "Badwater" on the shirt and wear it during the race because it was copyrighted. In addition, OSHA (Operational Safety and Health Administration) class 2 or 3 vest is required and depending on the time of the day, OSHA 3 vest with must be worn during nighttime (7pm to 7am) while either OSHA 2 or OSHA 3 vest should be worn daytime within Death Valley National Park perimeter. Once in, the excitement to officially start the Badwater training begins Key to this training is to build mileage at the same time simulate the intense heat which can reach 110 to 120 degrees during the Badwater 135 race month of July. It is suggested that one should do actual acclimatization to the Death Valley temperatures in July by arriving in the area few days before the race. Every runner in the race is required to have a crew. The race is designed to have a crew, they are the lifeline for evey racer. The crew vehicle carries the essentials for the next 2 days of the race that include most importantly water and ice, food in liquid and solid form, electrolytes and all the goodies that you are used to in running ultras. In Badwater 135, a maximum of four persons is allowed to crew. Miles 1-42 (Badwater Basin to Stove Pipe Wells): I felt right and strong and arrived Stove Pipe just before the sunrises. Mile 42 - 59 (Stove Pipe Wells to Townes Pass): Can' t run the uphill, trying to walked the hill fast. 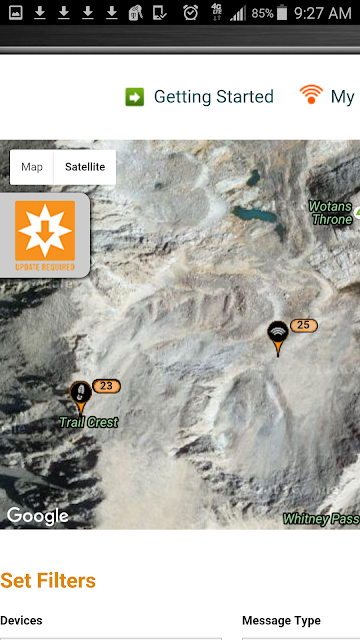 Mile 59 - 72 (Townes Pass to Panamint Springs: Feeling good at downhills. Depleted all calories. Whole body chilled and I had to stop for half an hour at mile 72. Felt uninterested. Mile 72 to 80 (Panamint Spring to Father Crowley): Very slow, but at least moving at a snail pace. Mile 80 to 90 (Father Crowley to Darwin): Mentally fine, I am officially out from Death Valley. Getting better as I saw vegetation in the surroundings. Mile 90 to 110 ( Darwin to Keeler): I was in a cruise control mode, mixing run-walk I was feeling good and my body was molding up. Mile 110 to 122 (Keeler to Lone Pine): I am tough again! Mile 122 to finish! (Dow Villa Hotel to Mt Whitney Portal): Just before the ascent, ate at Mc Donald Breakfast sandwich. Energized! The desert is never forgiving, and intimidating. However, it disconnects me from the modern world, from our phones and social media. I thought about all of the valleys and the unending mountainous roads and realized how small creatures we are in this vast, wide world. So much beauty, so much heat but miles and miles I have to go. Relentless forward motion is the only way to go. I cannot just stay out in the heat. 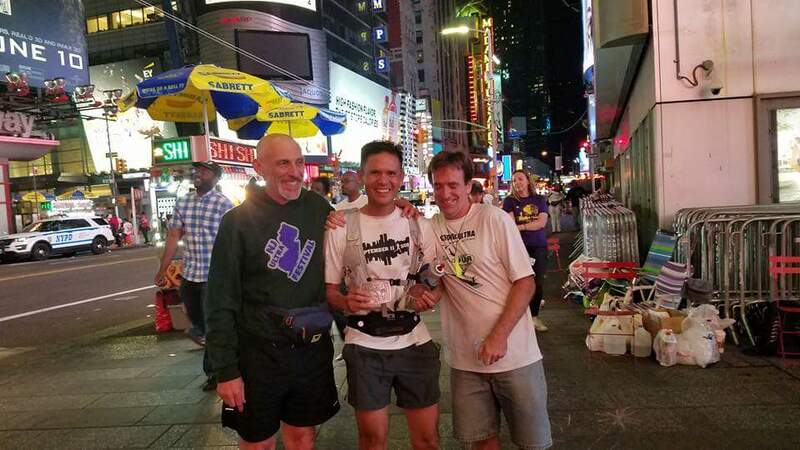 Finally, after enduring 135 miles of long paved road and relentless climbs on a hot cloudless sky, I successfully finished my third Badwater 135 with the time 41:42:20, 61st place overall that started July 18 at 8:00 pm and ended July 20 at 1:42 pm. The Badwater Ultramarathon was always designed to be toughest foot race in the world and in fact, the original, historical race course starts at the lowest point,of North America, that is the Badwater Basin at -282 ft into the highest point in the contiguous U.S.A, that is the summit of Mt. Whitney at 14,505 ft which has an estimated total distance of 146 miles. 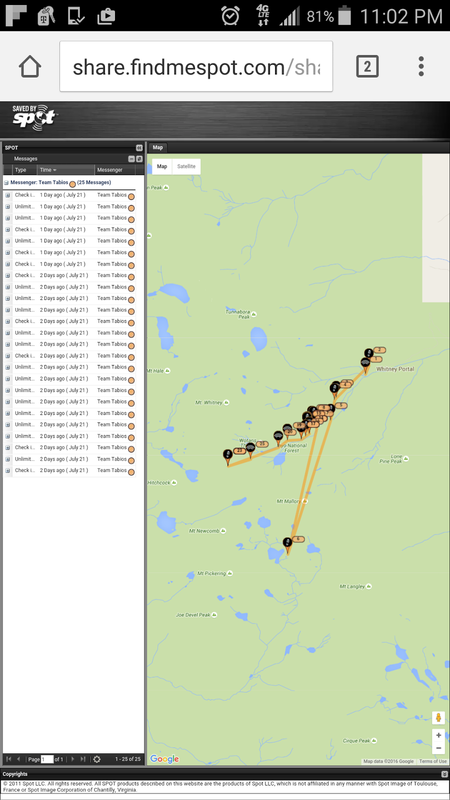 Note that the last 24 miles is an ascent from about 3,700 ft to 14,500 ft. In the literature, Badwater Basin is in fact the lowest point in the entire western hemisphere and that the summit of Mt. Whitney is the highest point in contiguous continental states area of United States of America. The race is even made tougher by holding it in the hottest place in the U.S.A. and during the hottest month of July. After several attempts at this first original, historical race course, Al Arnold in 1977 was the first to successfully complete the race course, summiting Mt Whitney eighty hours after his start at Badwater. Arnold has never returned to the course, except to receive the Badwater Hall of Fame Award. As a Badwater 135 finisher in 2014 and 2015, these thoughts and voices haunt me saying, why not pay homage to the race’s origins and honoring the people that came before me. 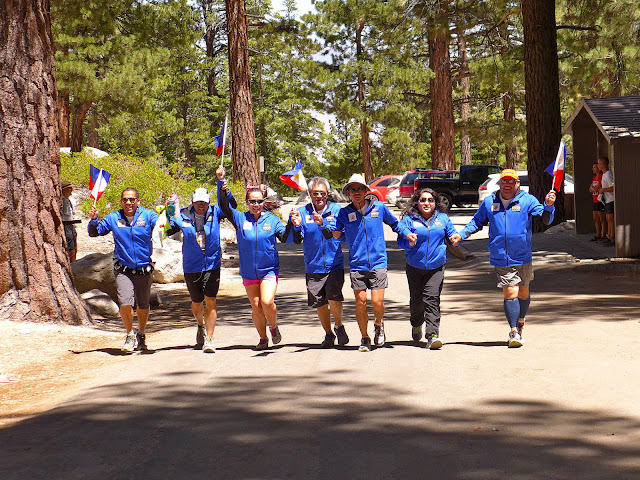 So in July 21, 2016, a day after finishing my Badwater 135, at 4:30 am five of us started the 11-mile hike to Mt Whitney which began in Mt Whitney Portal at elevation of about 8,300 ft. After 6 hours of hiking we only covered only 6 miles at elevations of around 11,000 ft. At this point, some of my team members began experiencing altitude sickness. We continued walking for another 4 hours reaching about 13,000 ft which was already around 1:00 pm. 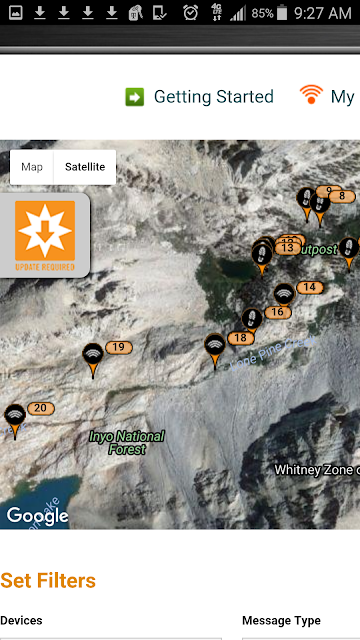 I continued with one of my team members to the Mt Whitney Trail Crest at elev. 13,600 ft. Exactly 2:19 pm at that point, it would probably take another 2 to 3 hours to reach the summit and we were advised by some climbers that it would then be become dark and too risky to go back down even with our headlamps. We have to call it a day then at Trail Crest. 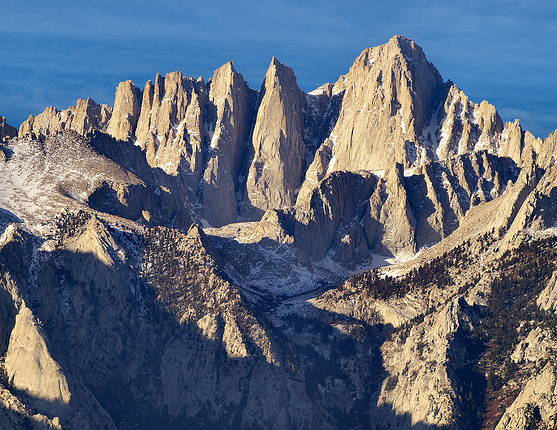 For unprepared, Mt Whitney is intimidating. The climb or extreme daywalk from 12,000 ft up is all rocks and hundreds of switch backs. Your body can grow tired and weary. The human spirit can do these things when they are pushed to the limit. But there is fine line between pushing your limits and the safety for everybody. 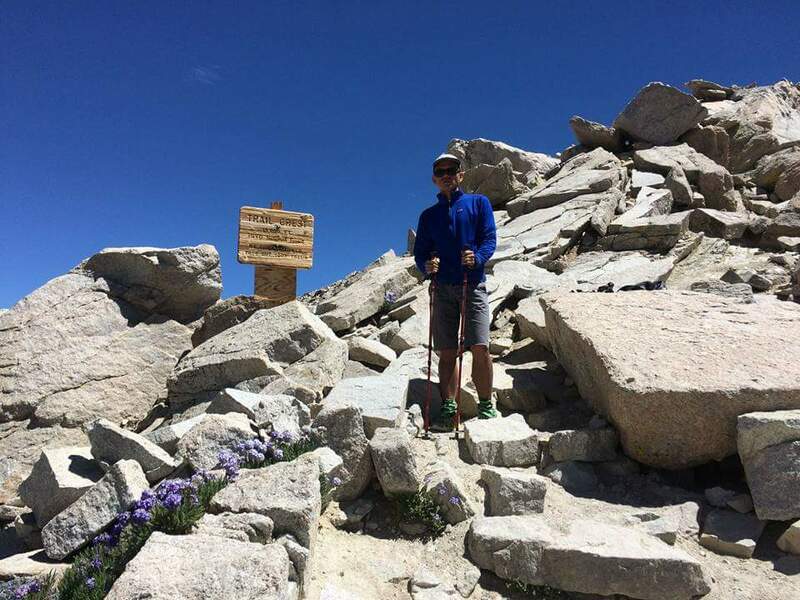 Though I was not abled to make it to the peak of Mount Whitney. I am still thrilled to be able to make it the Trail Crest at 13,600 ft. We were able to get back to the trailhead at 9:30 pm so that adventure we call it as an extreme dayhike took us about 17 hours. Short of the 900 ft. to Mt. Whitney summit, I believe I was almost there to join the Badwater purist but the voices will remain until one day, I will be at Mt. Whitney’s summit right after another day at Badwater 135. Finally, I am very grateful and sincerely thank my support crew for the efforts in this huge undertaking and making my 2016 Badwater 135 this year at huge success. Also, would like to express my sincere thanks to the staff of AdventureCorps for accepting me to the 2016 Badwater 135 Ultramarathon race. At Mt Whitney Trail Crest, elev. 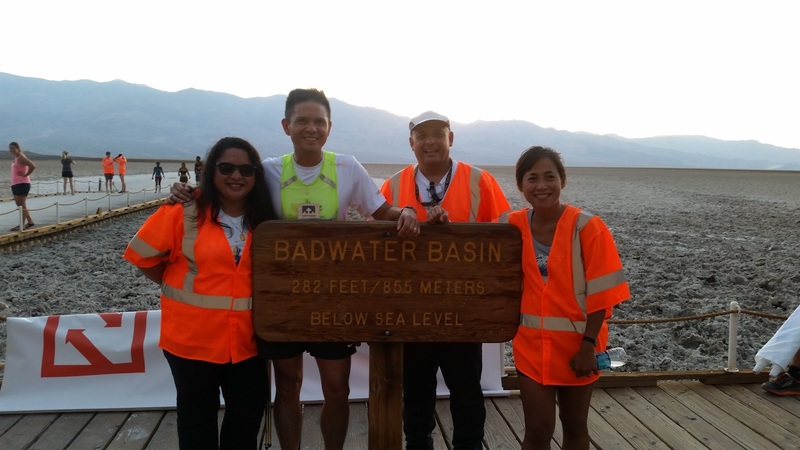 3,600 ft.
After enduring 135 miles of long paved road and relentless climbs on a hot cloudless sky, I successfully finished my third Badwater 135 ultramarathon held annually in Death Valley with the time 41:42:20, 61st place overall. 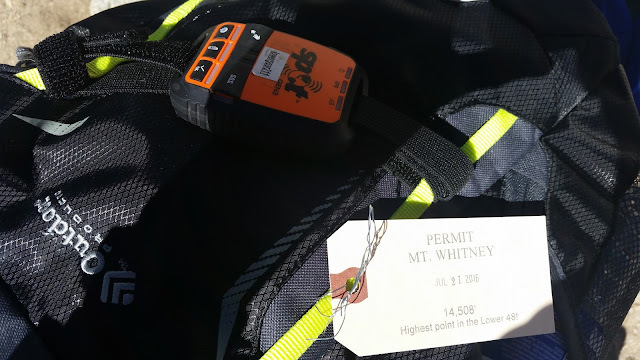 Then on following day, I attempted my quest in connecting the lowest to the highest points of the contiguos United States by continuing another 11 miles from the Mt Whitney Portal to the summit of Mt. Whitney, elev. 14,505 ft. Unfortunately, for some various reasons, at exactly 2:19 p.m. I decided to call it a day at the Mt Whitney Trail Crest at elevation 13,600 ft. However, I can't thank enough to my support crew for the efforts in this huge undertaking and making these plans to become a reality. 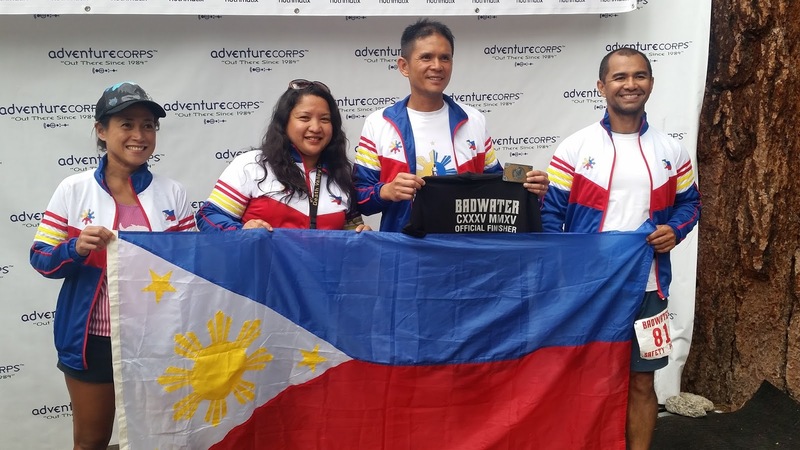 Also, would like to expressed my sincere thanks to the staff of AdventureCorps for inviting me to the Badwater 135 Ultramarathon race. I hope that this journey through the desert would teach me lessons in perseverance and strength. Just remember never give up and always look forward with one foot in front of the other. Links provided to track my progress from Badwater Basin to Mt Whitney Summit, across the Mojave Desert starting July 18, 2016, 8:00 P.M. Pacific Time. I will be wearing a SPOT device for tracking for the whole trek from Mt. Whitney Portal to the Mt. Whitney summit and back to the portal. Permit to start on July 21, 2016. I am announcing my 146 miles attempt from the lowest to the highest points in the contiguous United States in July. "Congratulations! You were successful in securing a reservation to enter to Mt. Whitney Zone- Day Use All Routes JM34.5MWZ on Thu Jul 21 2016 in the Mt Whitney Lottery 2016. 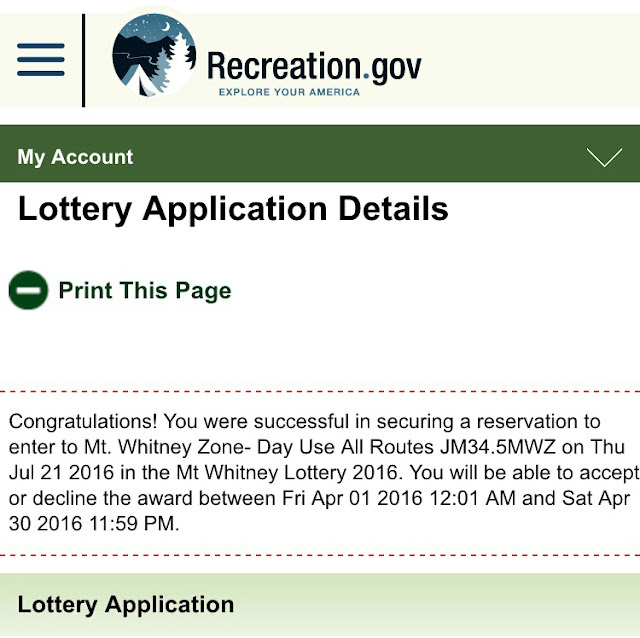 You will be able to accept or decline the award between Fri Apr 01 2016 12:01 AM and Sat Apr 30 2016 11:59 PM." 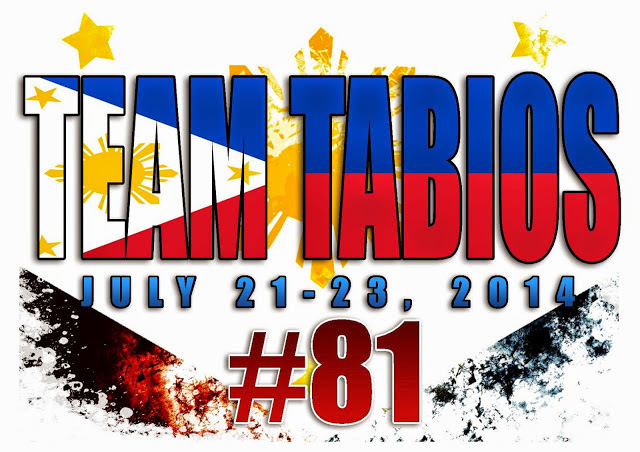 Starting July 18, 2016, together with my support team, "Team Tabios" will attempt to traverse the 146 miles of the Mojave Desert from Badwater Basin to Mt. Whitney summit. This is the classic crossing between the lowest to the highest points in the continental United States. Starting at 279 feet (85 m) below sea level in the Badwater Basin, in California's Death Valley, and ending at an elevation of 14,505 feet (4421 m) at the summit of Mt. Whitney. 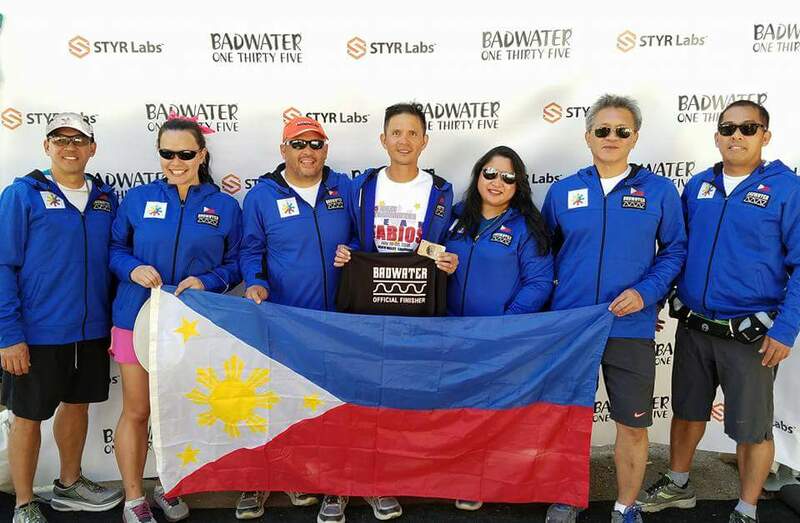 The trek from Badwater Basin to Mt Whitney will be done in conjunction with the STYR LABS Badwater 135 ultramarathon which is being well documented by the Adventure Corps on July 18- 20, 2016. Thus, the remaining 11 miles will not be a part of the race. However, it is rare to connect the 11 extra miles on the same day because of permit system by United States Forest Service. The permit issued to summit Mt. Whitney is set to start on July 21, 2016. 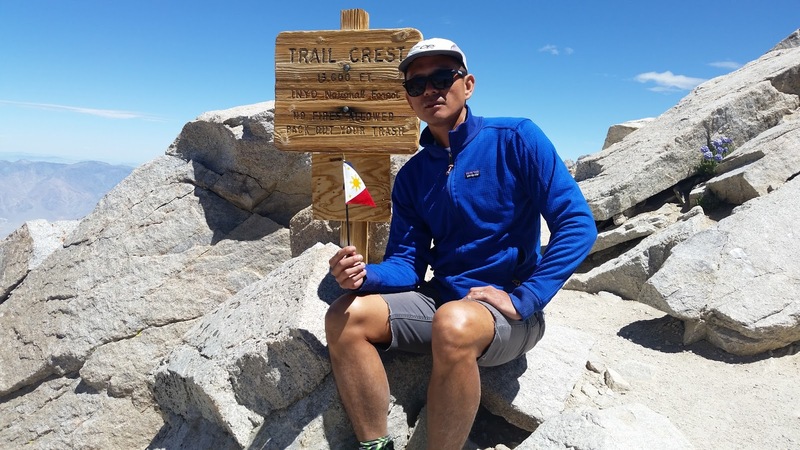 To ensure proper documentation, the summit to Mt Whitney will be monitored and supported by my team including some video footages and snapshots along any points on the trail. 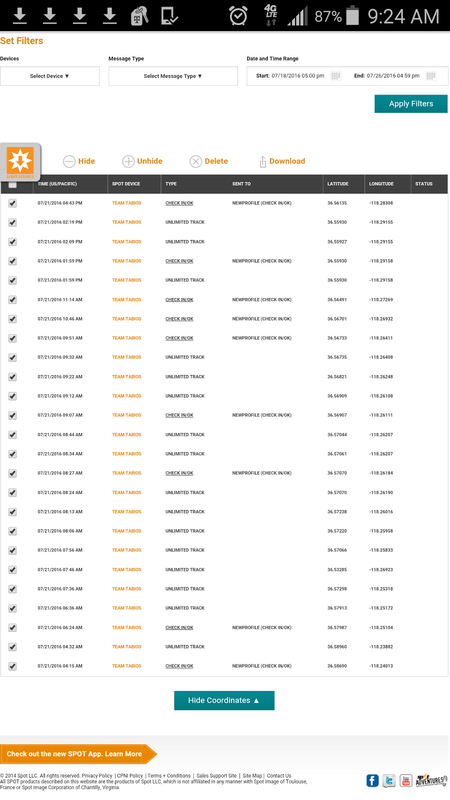 We will also be using a SPOT Gen3 device that can be publicly viewed and monitored. 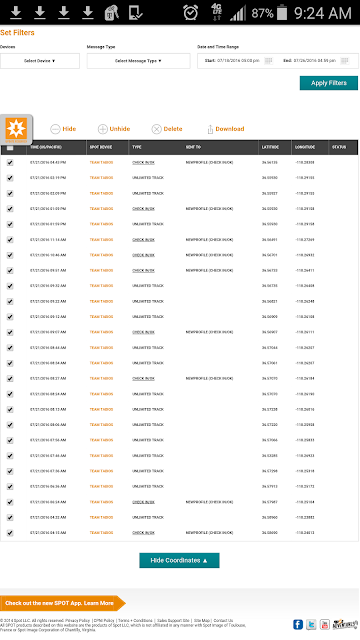 Spot tracking links will also be available here during race day. 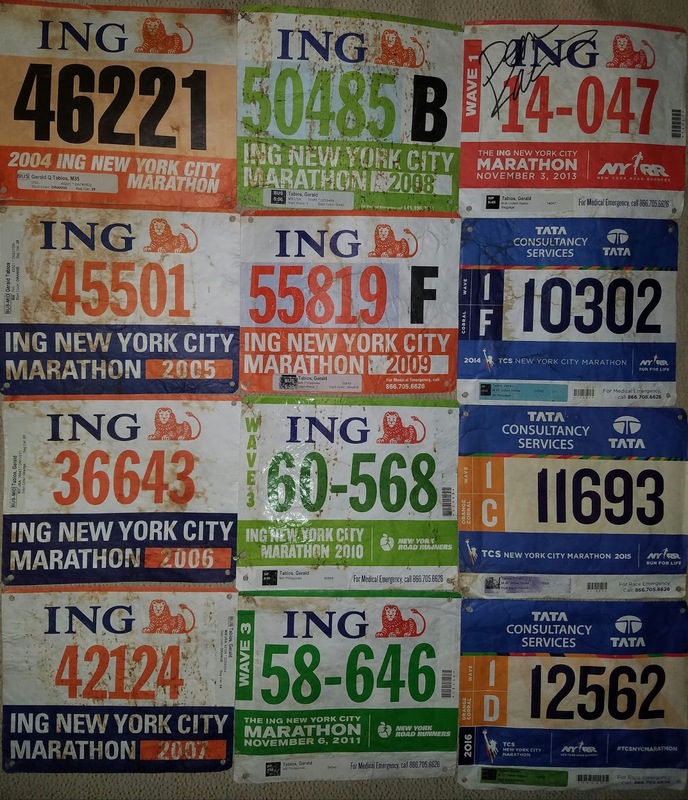 Fathers Day, June 19, 2016 - Completed my 5th Great New York Running Exposition 100 miles (TGNY 100) finished 6th out of 34 finishers with a time of 21:58:20. I made it to the start and finish of every race since 2012. I am now an inaugural member of the TGNY 100 500-mile Club together with Michael Samuels. Michael Wardian (16:12:57) and Charlotte Dequeker (20:04:05) won the race for male and female. A huge thanks to RD's Phil Mcarthy and Trishul Cherns for the teriffic and well organized race. They are both an inspiration in my ultrarunning since my first 100 mile buckle. 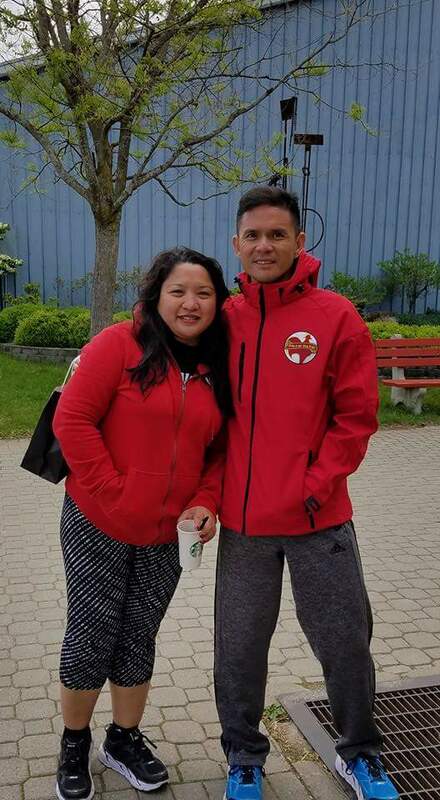 Awesome volunteers in every aid statiions. 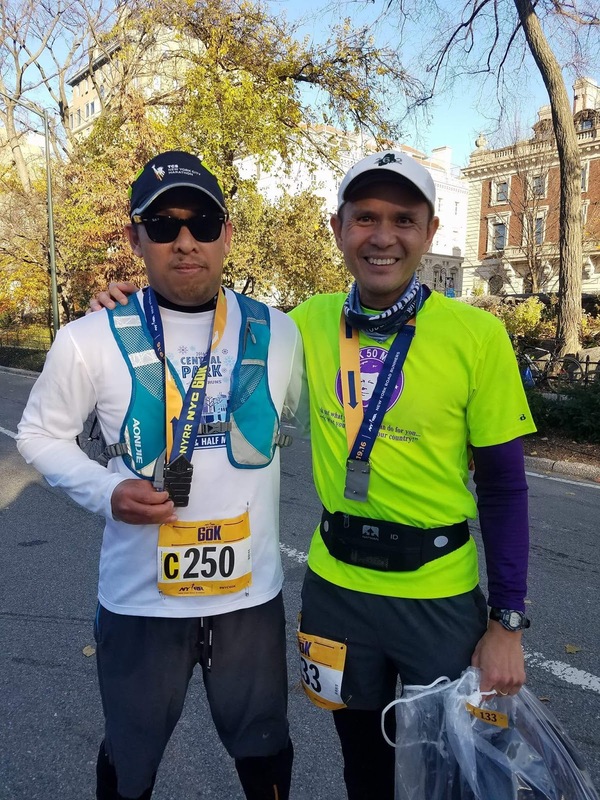 Very fortunate to have my pacers, Herry Lesmana and Vladimir Garcia pushed me from mile 60 up to the finish. 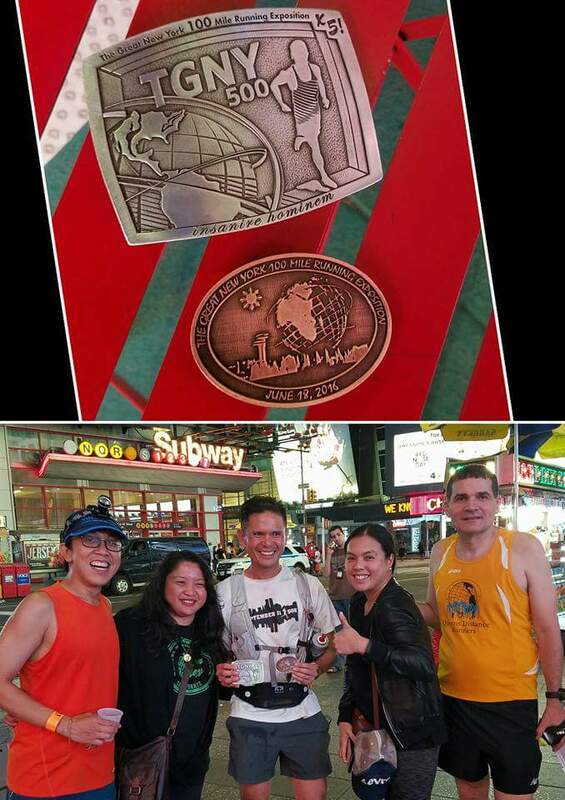 Thanks, Mico for driving Vlad to mile 75 and Shiboom for coming with my wife at Times Square. Awesome race! Beautiful course along the Pennypack creek at Pennypack Park in Philadelphia. The course features a bunch of short but steep rolling hills along with a trail section. Finished with a time of 3:47:15, 15th overall and awarded 2nd place for my age group 45-49. These age group awards come from the Black Forest of Germany. They are german weather houses. There is a gut string inside which reacts to all changes in air humidity. Depending on weather the air is dry or humid, the gut string changes it's position and twists more or less, so that the female turns outside when it is dry (predicting nice weather) and the male, when it is humid. 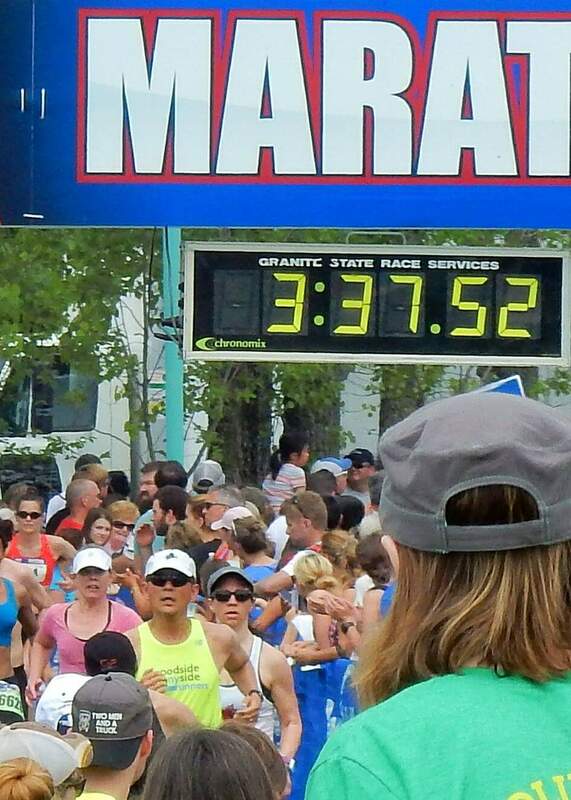 May 29, 2016 - Finishing the Vermont City Marathon in Burlington, Vermont with net time of 3:37:25 just minutes before the race was cut short at around noon as race conditions have reached the extreme level of the Emergency Alert System. 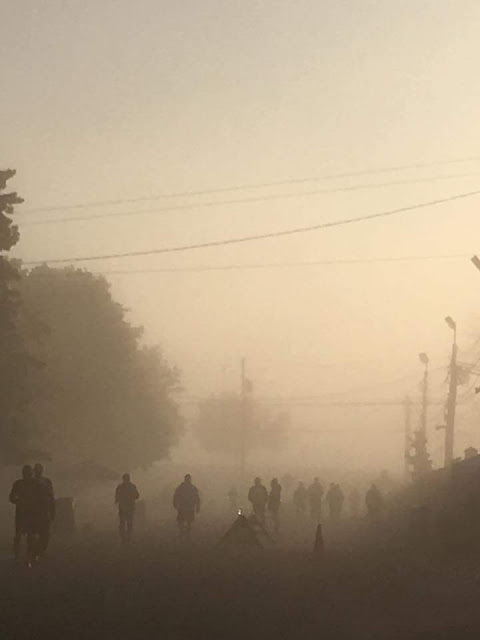 Early morning on Day 2. 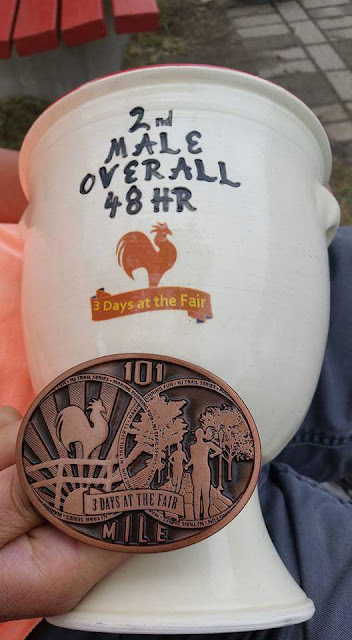 Won 1st place for men on the 48-hour ultramarathon timed race at the 3 Days at the Fair held in Augusta, New Jersey. Finally stopped my relentless forward motion at 47 hours, 47 minutes and 39 seconds. 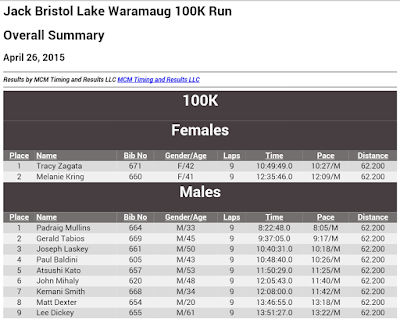 Although not a PR but good enough for the first place. Also, awarded a 500 miles coin for my total lifetime mileage award. Now a member of the 500 mile club. On Saturday, April the 30th The Queens Distance Runners hosted runners of New York City area the Inaugural Queens Marathon. It also marked my 40th marathon, a race just at my neighborhood in Queens, inside the Flushing Meadow Park. It was a historic event to all runners. 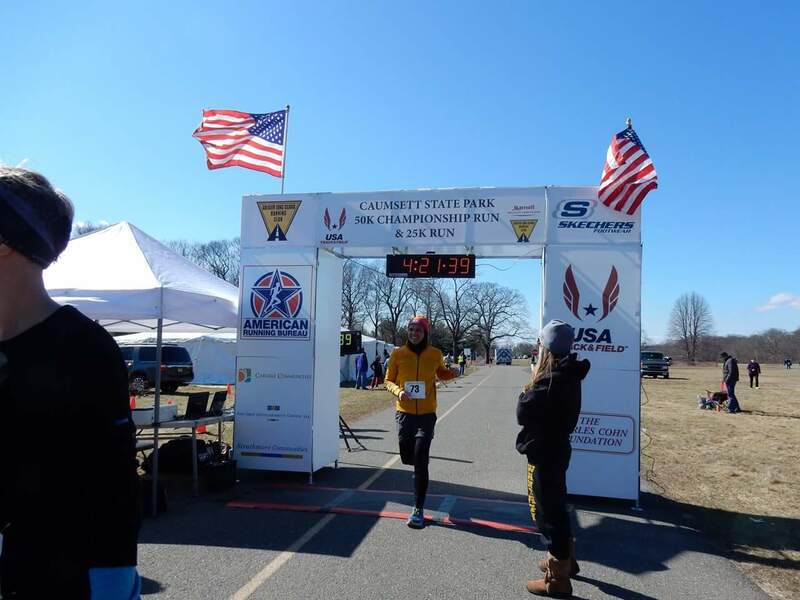 Finish time of 3:27:17, 25th among a field of 192 overall finishers and 4th out of 40 total finishers in the Male 40 to 49 age group. April 24, 2016-Finished 2nd place for men in this years Lake Waramaug 100k race held in New Preston, Connecticut. The lone female won the overall at the races. 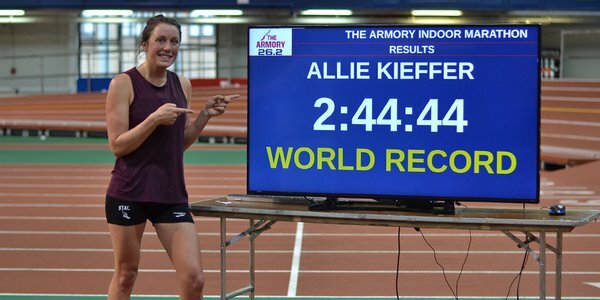 This weekend, Saturday April 9th, the Armory Track is hosting an indoor marathon with the hopes that someone will break the indoor marathon world record (currently 2:27:21 for men and 2:53:53 for women). In addition to the individual marathon there will be multiple marathon relays taking place from Friday through Sunday to raise funds for the track. I am so thrilled and excited to be with the fastest runners in the U.S. I am the only runner with the slowest personal records amongst the seven male runners and a lone female. 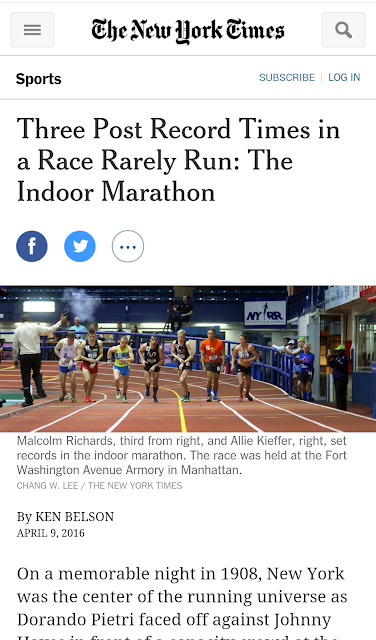 All of them had a personal records of under 2:30 or sub 3 hour marathons. 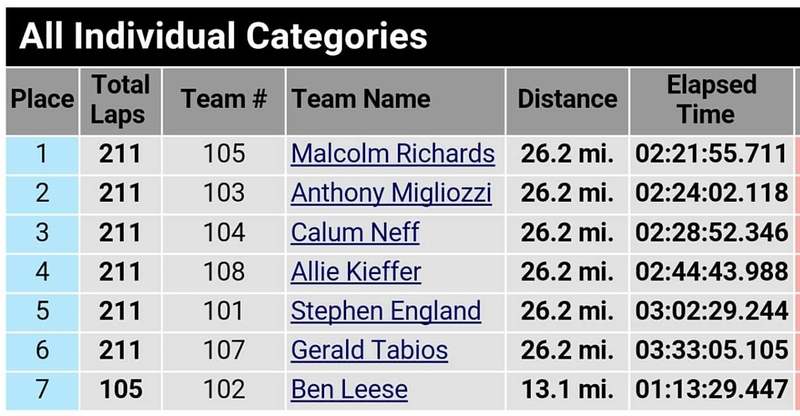 These following are the expected starters for the individual marathon. 2. 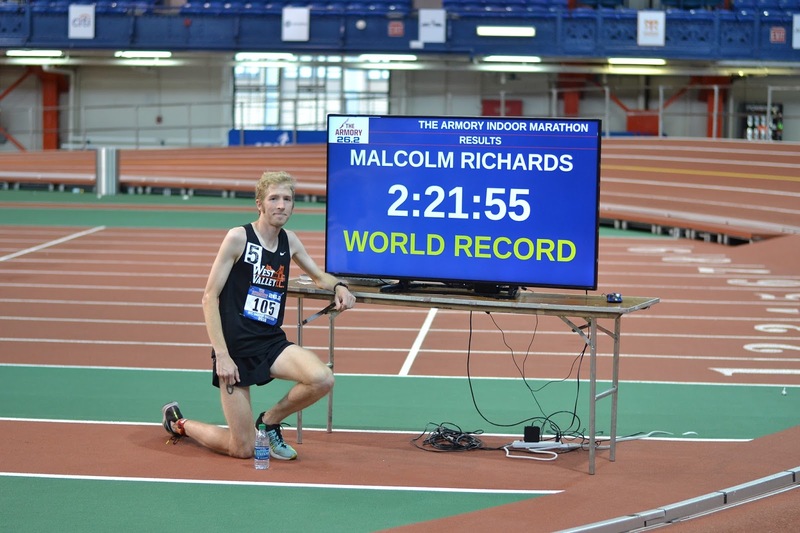 Calum Neff - Marathon PR of 2:22 and Guinness World Record holder for Half Marathon pushing a stroller in 1:11.27. 5. Chris Solarz - Multiple Guinness World Record Holder: Stopping at all New York's 468 subway stops in less than 24 hours, another for visiting 250 bars in less than 24 hours, and one for climbing 33,000' up stairs in less than 12 hours and 12 hour treadmill run (77.07) set in 2014. He has a marathon PR in less than 3 hours. BEAUTIFUL DAY AT CAUMSETT PARK 50K! A certified 5 kilometer loop on a paved path through Caumsett State Historic Park. 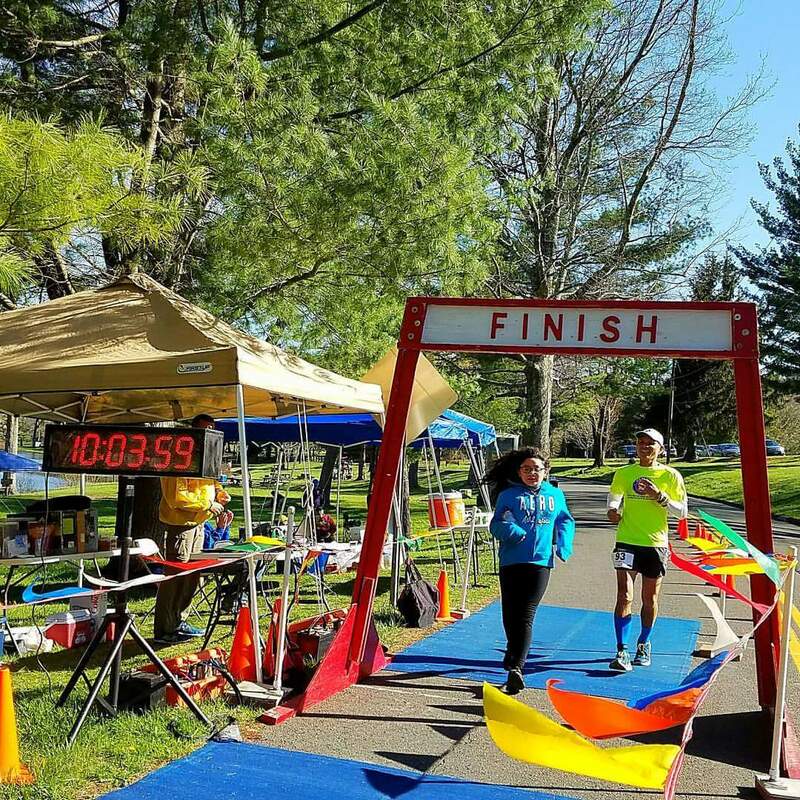 This race will give you the chance to explore this beautiful park with outstanding scenic views overlooking Long Island Sound. 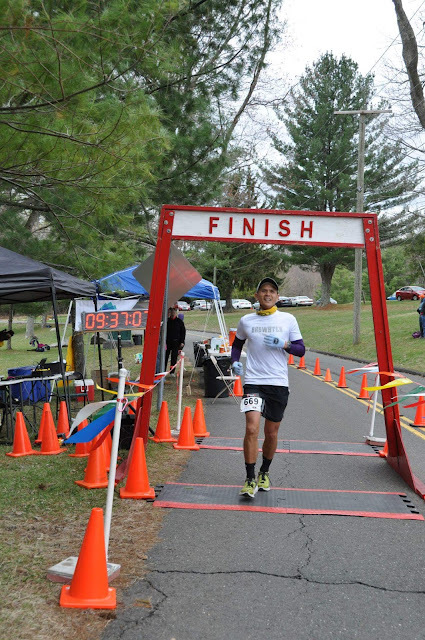 My official finish time for 50k was 4:21:39 with an average pace through the race was 5:13/Km. 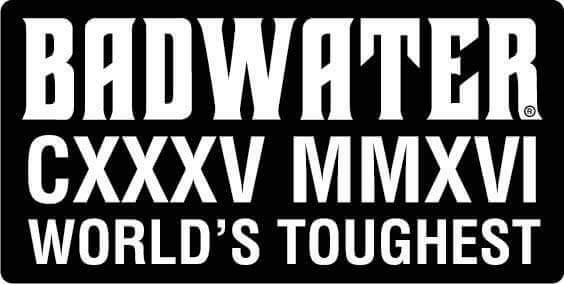 I am so honored to be selected again to run Badwater 135. Thank you to AdventureCORPS, Inc.! 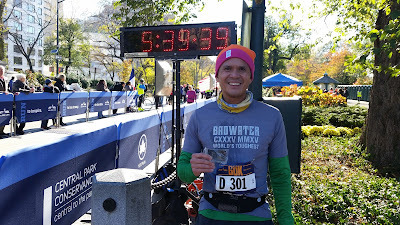 On November 14 2015 - Finished my 5th NYC 60 K with a finish time of 5:38:24 at a 5:38/Km pace. 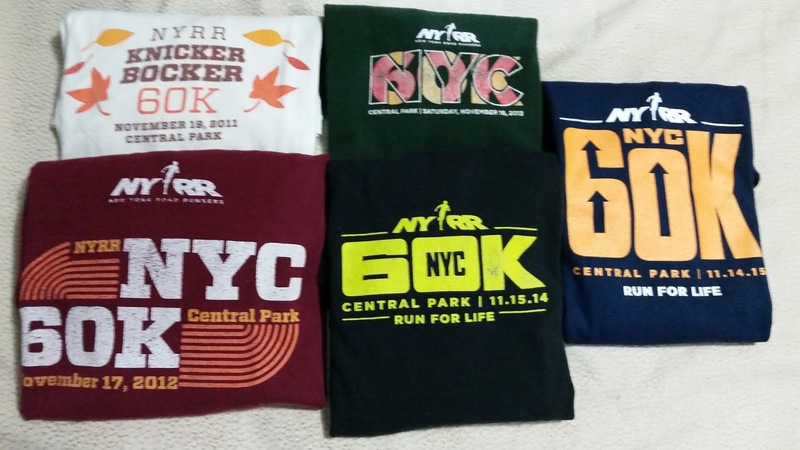 The NYC 60, formerly Knickerbocker 60 is a race with a long history for New York City area ultrarunners and the only ultramarathon on NYRR's annual calendar. 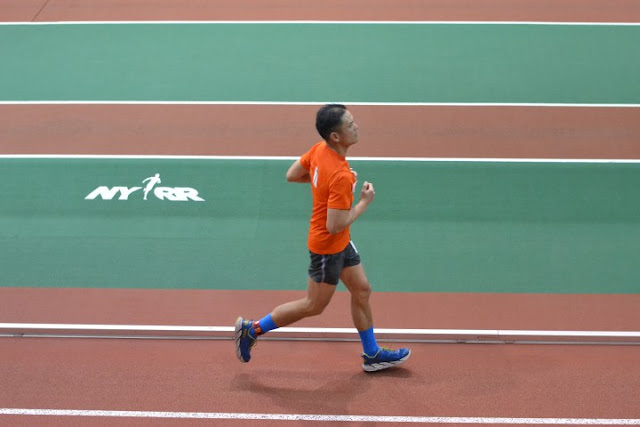 September 30, 2015 - Despite hitting my qualifying time by 1 minute and 33 seconds at last year's Steamtown Marathon. 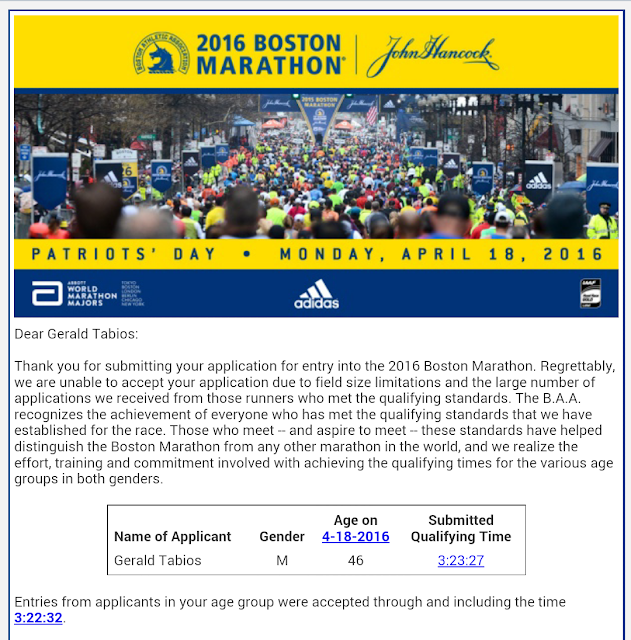 I did not get into the cut-off for next year's Boston Marathon. Only runners who ran 2 minutes 28 seconds or faster than their standard were accepted. Congratulations!!! 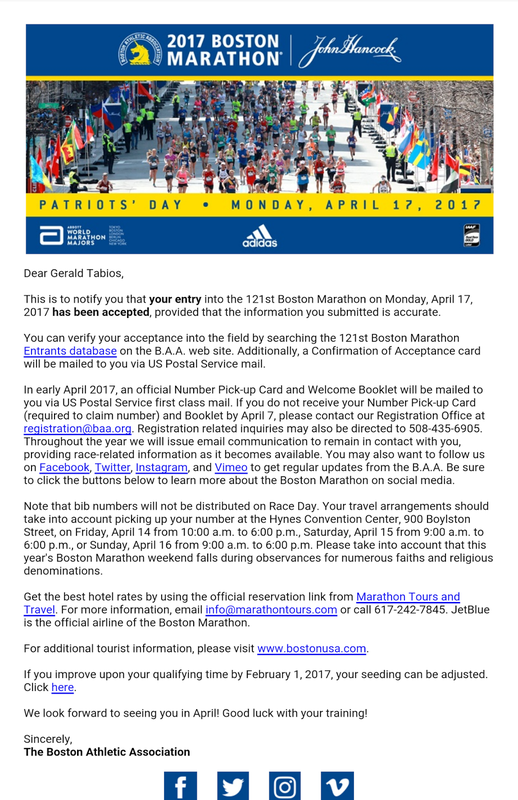 To all who made it to 2016 Boston Marathon. Despite of some dramas along the road, I was always encouraged to move on by my team. It me took 42 hours 52 minutes and 9 seconds to complete the Badwater 135 covering 135 miles (217 kilometers) from the Badwater Basin in Death Valley to Mt. Whitney Portal in Lone Pine, California. It was pure elation and surreal with my team when the finishing tape coming into view, words can't tell my thanks to my team in getting me to my dream. "To feel pain is good, It means you are still alive." 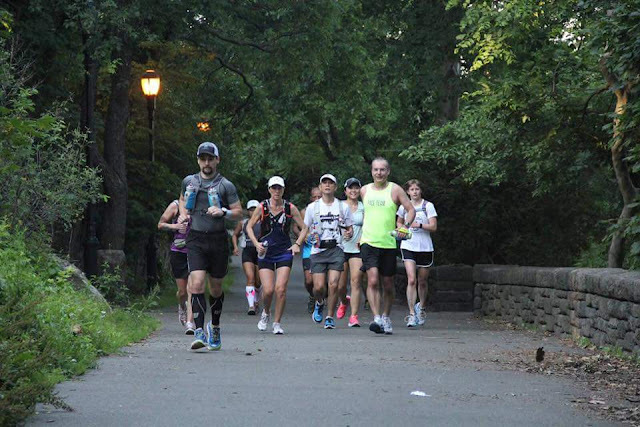 June 21, 2015-Finished the 100-mile journey through the streets and parks in New York City in 22:26:23. My fourth time to complete the event. Fellow ultrarunners Otto Lam and Michael Samuels and including myself are the only runners to have run every TGNY 100 since its inception in 2012. 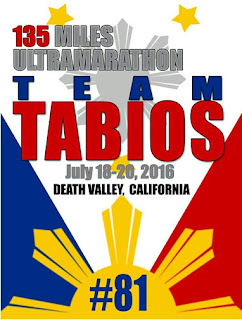 INVITED TO RUN BADWATER 135 AGAIN! On Monday, July 28-30, 2015, I will be representing Philippines altogether with my all-Filipino support crew dubbed as the "Tabios Team #81", competing against 96 of the world’s best endurance athletes representing 23 countries worldwide in the Badwater Ultramarathon, a 135-mile race across Death Valley in California, where the air temperature can reach to 130 degrees Farenheit and surface temps can hit 200 degrees Farenheit. 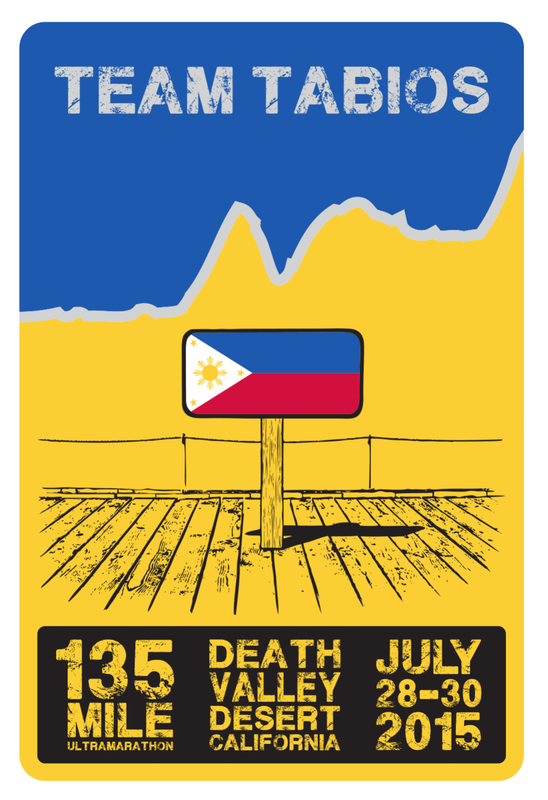 According to National Geographic, the Badwater 135 is the “toughest footrace on Earth.” I will be the lone Pinoy competing and the first Filipino to run Badwater 135-mile back-to-back. The start line is at Badwater, Death Valley, which marks the lowest elevation in the North America at 280’ (85m) below sea level. The race finishes at Mt. Whitney Portal at nearly 8,300’ (2530m). The Badwater course covers three mountain ranges for a total of 13,000’ (3962m) of cumulative vertical ascent and 4,700’ (1433m) of cumulative descent. Badwater has been a goal of mine since I started running ultramarathons. Although, this will be my second Badwater 135, but what draws me back is the desire for a faster time. Also, this race allows me to represents my background on an international stage and help inspire others " na kaya natin to". 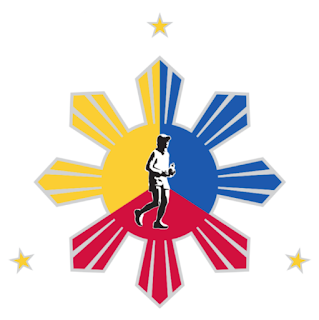 Note: The race will start on July 29, 2015, Wednesday at 11:00 am, Philippine Standard Time. 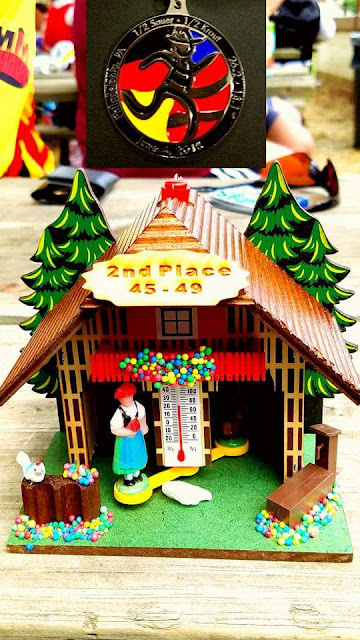 On May 17 2015, I completed the 3 Days at the Fair 48 Hours timed race held Augusta, New Jersey. I finished with a total of 171 miles ( 273.6 kilometers) 9 miles short of my target goal of 180 miles. 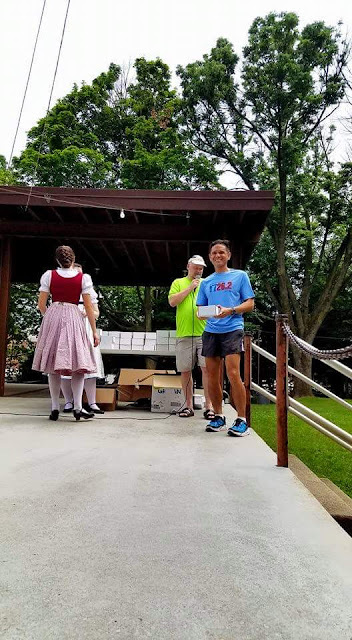 I received the 2nd place overall award for the 48-hour event. Also got my 101 mile buckle and 49 miles to go to be in the 500 Mile Lifetime Miles Club. An amazing experience, endured the highs and lows throughout the race, at some point it is all mental. FINISHED LAKE WARAMAUG 100K IN 9:37:05! 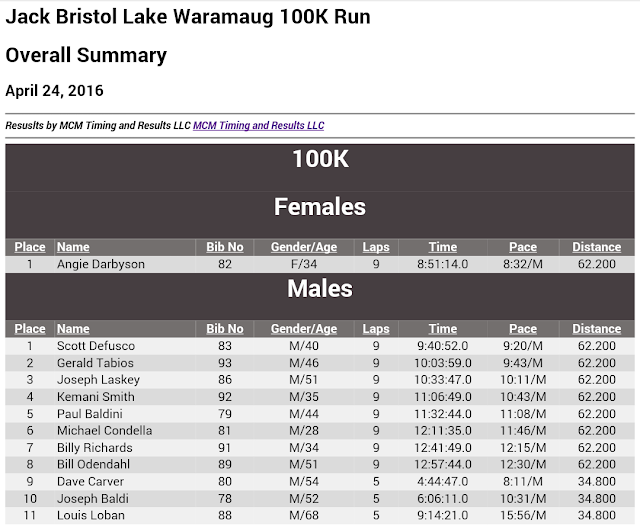 I completed the Jack Bristol Lake Waramaug 100k in 2nd Place. The race was held on April 26, 2015 in Lake Waramaug State Park on a cool and cloudy with a light wind and no rain.